Chennai is most commonly thought of as a gateway to Tamil Nadu, the land of thousands of magnificent temples. What’s less known is that the city has had a long association with Christianity since as far back as the 1st century AD, and is peppered with beautiful churches built by the colonial powers between the 16th and 20th centuries. The Church of Our Lady of Light, locally called the Luz Church, is probably the oldest church in Chennai. In the early 16th century, Vasco da Gama, the famous Portuguese explorer, discovered a maritime route to India. Right after that, it is said that 8 Portuguese priests came to India to preach Christianity. On their way to the eastern shores of south India, they were hit by bad weather and got lost at sea. Legend has it that a bright light mysteriously appeared out of nowhere and guided them to safety. This church was built in the year 1516 at the place that the light led them to. There are two more iconic churches in Chennai originally built by the Portuguese, and both have a deep connection with St. Thomas, one of the 12 apostles of Jesus Christ. It is said that he was unable to believe the news of Jesus Christ’s resurrection, and needed proof to be convinced of it—this was the origin of the phrase ‘doubting Thomas’. St. Thomas is believed to have travelled to south India in the middle of the 1st century AD, to spread the gospel. Many historians credit him with bringing Christianity to India. He is said to have arrived on the Malabar Coast and eventually made his way to the eastern coast. In 72 AD, he was killed at St Thomas Mount and buried in the Mylapore area of Chennai. This version of history is however debated by many. So the objective of the photo essay remains. The fable of St. Thomas in India as presented by Madhumita Gopalan in The News Minute is Indian history. But if truth be told, it isn’t Indian history. This writer has shown in his carefully researched book, The Myth of Saint Thomas and the Mylapore Shiva Temple, that forty plus leading historians and scholars, many of them Christian divines, have doubted and denied Thomas’s travels to India and a few have even doubted his existence. The point is that the St. Thomas in India story is a legend and it should be identified and presented to the public as a legend—indeed a Catholic legend as Protestants reject it—by the media. But the Indian media has shown itself to be a pusillanimous institution, neither well-informed or ethical, so appeasing a minority Indian community by presenting its favorite religious fairy tale as true Indian history is quite fine by them. 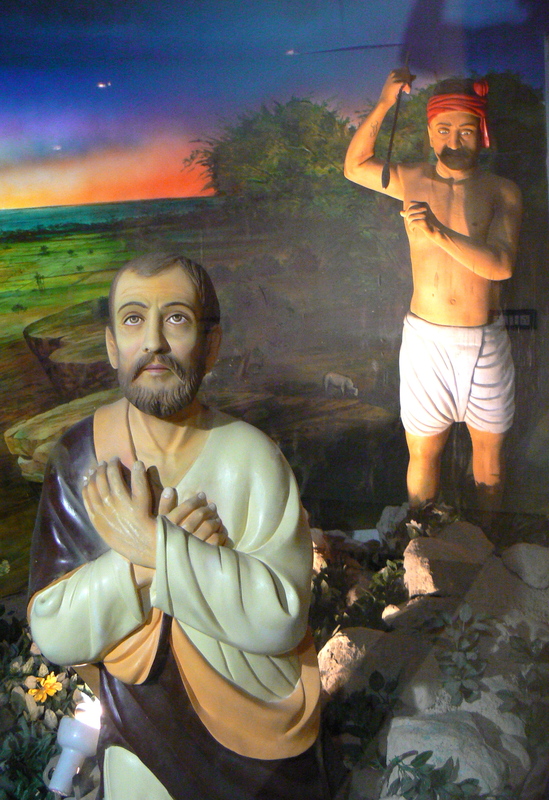 But it is not quite fine by the Hindu community that stands accused of killing St. Thomas out of jealousy. The accusation is vicious and false, a blood libel on the Hindu nation, and if the media continues to make it it will have to be taken to a court for review. Four of the five Portuguese churches in Madras are built on temples ruins. Had the author of the article above visited the San Thome Cathedral museum, she would have found in it carved stone pillars and other artefacts that may have been part of the original Kapaleeswara Temple that the cathedral church replaces. Christians, like Muslims, are quite proud of the fact that they have destroyed the heathen temples of Hindus in Hindustan. In 1996 this writer asked the Vatican archives for information or confirmation that St. Thomas had visited India. The Vatican’s reply was that it was a matter for historians to decide. And indeed a leading Catholic theologian and scholar did decide the issue in 2006 when Pope Benedict XVI stated that St. Thomas did not take Christianity to South India. This being the case, the discussion should end with Pope Benedict’s statement. But it does not end because the media is still squeezing money—and Hindu blood—from the fable. We are letting a leading historian and Indologist who studied under Jesuits have the last word here on St. Thomas in India. According to Christian leaders in India, the apostle Thomas came to India in 52 AD, founded the Syrian Christian Church, and was killed by the fanatical Brahmins in 72 AD. Near the site of his martyrdom, the St. Thomas Church was built. In fact this apostle never came to India. The Christian community in South India was founded by a merchant called Knai Thoma or Thomas of Cana in 345 AD—a name which readily explains the Thomas legend. He led four hundred refugees who fled persecution in Persia and were given asylum by the Hindu authorities. In reality, the missionaries were very disgruntled that the damned Hindus refused to give them martyrs (whose blood is welcomed as “the seed of the faith”), so they had to invent one. Moreover, the church which they claim commemorates St. Thomas’s martyrdom at the hands of Hindu fanaticism, is in fact a monument of Hindu martyrdom at the hands of Christian fanaticism. It is a forcible replacement of two important Hindu temples—Jain and Shaiva—whose existence was insupportable to the Christian missionaries. A soft cover printed edition of The Myth of Saint Thomas and the Mylapore Shiva Temple is available from publisher Voice of India at Aditya Prakashan, New Delhi. It has an extensive bibliography and is a valuable tool for researchers and South Indian newspaper editors. This entry was posted in knai thoma, madras-mylapore archdiocese, media, mylapore, santhome cathedral, st. thomas and tagged blood libel, christian myth, kapaleeswara temple, mylapore, portuguese india, santhome cathedral, st. thomas. Bookmark the permalink.